Riverdale's season three has officially kicked off. And, with that, fans finally found out what's going to happen to Archie after he was arrested for murder at the end of last season. This post contains spoilers for the premiere of Riverdale's third season. 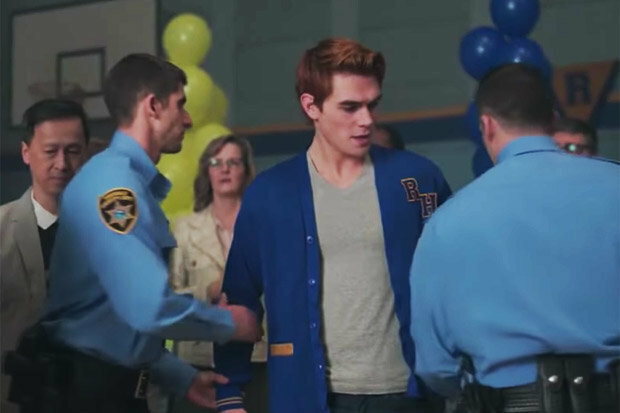 Right, a quick recap first: Archie was arrested in the final moments of the season 2 finale for the murder of Cassidy Book, the shop clerk from when they went on a weekend getaway to Shadow Lake. Four men broke into the lake house that the core four - Archie, Jughead, Veronica and Betty - were at, threatening the Riverdale favourites' lives. Veronica managed to set off a silent alarm, which led the intruders to flee - and Archie chasing down one of them. He knocked the guy down to the ground and was ready to punch him when Andre, Hiram's doorman/associate/possible hitman? showed up and told him he would take care of it. As Archie headed back to the rest of the group, he heard a gunshot behind him. 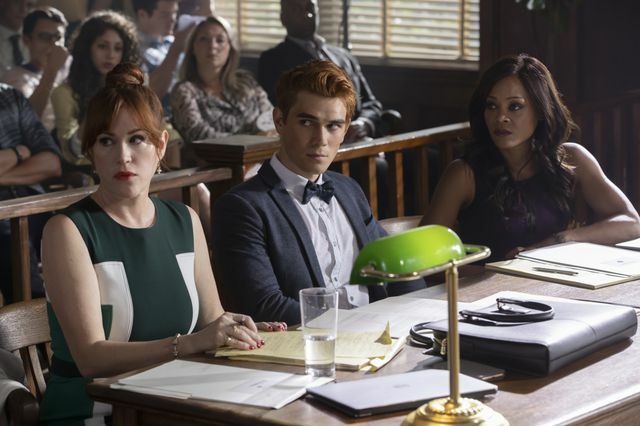 The premiere for season three kicks off towards the end of summer, back around Labour Day weekend - and the end of Archie's trial. 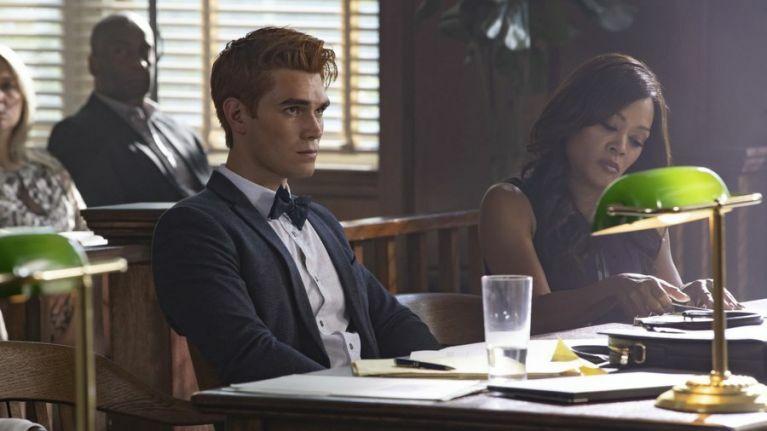 The prosecution claims that Archie is a "cold-blooded killer", while Archie's mum (who is also one of his lawyers) insists that there is "nothing here that proves that Archie Andrews is anything less than an innocent boy." Now that the closing arguments are over, the judge sends the jury away - and when they can't come to a verdict quick enough, the judge dismisses the court to reconvene after the long weekend. He also advises Archie to spend his family and loved ones. So, he seems pretty convinced Arch is about to be locked up. After a confrontation on the courthouse steps between Hiram and Fred, the core four head to Pop's to try and find a way to prove Archie's innocence. However, he insists that he wants to have a totally normal Labour Day weekend. It's Riverdale, though, so nothing's ever really normal-normal - although they do manage to have a pretty good long weekend...minus the gang war. And the weird cult-like situation at Betty's house. There's a lot of drama to unpack in the episode - but when we finally get back to the trial, the tension really ramps up. Just watched the premiere of #Riverdale ...holy hell. Archie saying goodbye to his dog "just in case" the morning of his last day of trial just broke me. The jury is deadlocked, six votes to six votes, with the foreman announcing that this won't change. The state then offers Archie a deal: time served, as well as two years in juvenile detention. Against the advice of everyone, Archie stands up and declares that he will take it. He doesn't want to put anyone through another trial - and he's taken away. 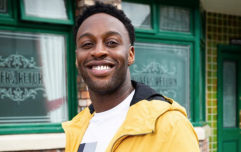 Archie's mum has to head back to Chicago, but she's already written his appeal - and Fred (as well as F.P. and Sheriff Keller) tell her not to worry about it, they'll prove Hiram was the one orchestrating it. And Hiram finally Veronica the reason he did all this - and it wasn't to hurt Archie, like she (and viewers) has suspected. He tells his daughter that he did this to punish her, as "you chose that boy over blood." New episodes of Riverdale season three arrive on Netflix every Thursday.